Have you seen this cute bird? 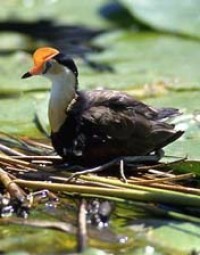 The comb-crested Jacana occupy coastal and sub-coastal regions from the Kimberleys in Western Australia, through northern Australia and down the east coast of New South Wales. They are more common in the north though and they also occur in New Guinea, Indonesia and the Philippines. The dad is the dedicated carer of their young and will hoist them up under his wings to remove them from danger. Today I read a neat article written by Emma Siosian on ABC Mid North Coast about this bird. It has some wonderful images of a dad with his chicks under his wings, an interesting read (well for me it was).